This year Starr County Community Coalition held the annual Family Fun at Colonias Unidas. 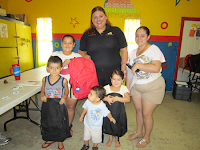 Children received a backpack with school supplies. Families were also information on the dangers of tobacco and secondhand smoke. Special thanks to Rio Grande Valley Council for providing the school backpacks and Pediatric Practice Association, BFG Laboratory Services, STCADA, Border Region MHMR, TMC Headstart, DSHS Immunization Department, SCAN, Inc. for donating the much needed school supplies. Thanks to Daisy Elizondo for providing us with refreshments. Last of all, I would like to express gratitude to all of you that gave time and effort to make this event possible. Sandra Garza-Starr County Community Coalition, SCAN, Inc.